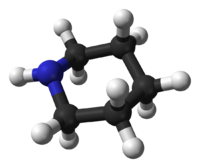 Piperidine is an organic compound with the molecular formula (CH2)5NH. This heterocyclic amine consists of a six-membered ring containing five methylene bridges (–CH2–) and one amine bridge (–NH–). It is a colorless liquid with an odor described as objectionable, and typical of amines. The name comes from the genus name Piper, which is the Latin word for pepper. Although piperidine is a common organic compound, it is best known as a representative structure element within many pharmaceuticals and alkaloids. Piperidine was first reported in 1850 by the Scottish chemist Thomas Anderson and again, independently, in 1852 by the French chemist Auguste Cahours, who named it. Both men obtained piperidine by reacting piperine with nitric acid. Pyridine can also be reduced to piperidine via a modified Birch reduction using sodium in ethanol. Piperidine itself has been obtained from black pepper, from Psilocaulon absimile (Aizoaceae), and in Petrosimonia monandra. The piperidine structural motif is present in numerous natural alkaloids. These include piperine, which gives black pepper its spicy taste. This gave the compound its name. 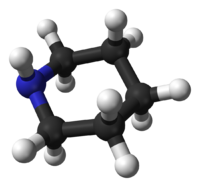 Other examples are the fire ant toxin solenopsin, the nicotine analog anabasine of tree tobacco (Nicotiana glauca), lobeline of Indian tobacco, and the toxic alkaloid coniine from poison hemlock, which was used to put Socrates to death. Piperidine is used as a solvent and as a base. The same is true for certain derivatives: N-formylpiperidine is a polar aprotic solvent with better hydrocarbon solubility than other amide solvents, and 2,2,6,6-tetramethylpiperidine is a highly sterically hindered base, useful because of its low nucleophilicity and high solubility in organic solvents. A significant industrial application of piperidine is for the production of dipiperidinyl dithiuram tetrasulfide, which is used as an accelerator of the sulfur vulcanization of rubber. Minoxidil is a piperidine derivative widely used to prevent hair loss. Piperidine is listed as a Table II precursor under the United Nations Convention Against Illicit Traffic in Narcotic Drugs and Psychotropic Substances due to its use (peaking in the 1970s) in the clandestine manufacture of PCP (1-(1-phenylcyclohexyl)piperidine, also known as angel dust, sherms, wet, etc.). ^ "Front Matter". Nomenclature of Organic Chemistry : IUPAC Recommendations and Preferred Names 2013 (Blue Book). Cambridge: The Royal Society of Chemistry. 2014. p. 142. doi:10.1039/9781849733069-FP001. ISBN 978-0-85404-182-4. ^ Hall, H. K. (1957). "Correlation of the Base Strengths of Amines". J. Am. Chem. Soc. 79 (20): 5441–5444. doi:10.1021/ja01577a030. ^ pKa value of piperidinium (protonated piperidine), corresponding to a pKb value of 2.78 for piperidine. ^ Frank Johnson Welcher (1947). Organic Analytical Reagents. D. Van Nostrand. p. 149. ^ Senning, Alexander (2006). Elsevier's Dictionary of Chemoetymology. Amsterdam: Elsevier. ISBN 978-0-444-52239-9. ^ Warnhoff, Edgar W. (1998). "When piperidine was a structural problem" (PDF). Bulletin for the History of Chemistry. 22: 29–34. ^ Anderson, Thomas (1850). "Vorläufiger Bericht über die Wirkung der Salpetersäure auf organische Alkalien" [Preliminary report on the effect of nitric acid on organic alkalis]. Annalen der Chemie und Pharmacie. 75: 80–83. doi:10.1002/jlac.18500750110. ^ Späth; Englaender (1935). "Über das Vorkommen von Piperidin im schwarzen Pfeffer". Chemische Berichte. 68 (12): 2218–2221. doi:10.1002/cber.19350681211. ^ Pictet, Amé; Pictet, René (1927). "Sur l'alcaloïde volatil du poivre". Helvetica Chimica Acta. 10: 593–595. doi:10.1002/hlca.19270100175. ^ Rimington, Claude (1934). "Psilocaulon absimile N.E.Br. as a stock poison". South African Journal of Science. 31: 184–193. hdl:10520/AJA00382353_6425. ^ Arbiser, J. L.; Kau, T.; Konar, M.; et al. (2007). "Solenopsin, the alkaloidal component of the fire ant (Solenopsis invicta), is a naturally occurring inhibitor of phosphatidylinositol-3-kinase signaling and angiogenesis". Blood. 109 (2): 560–5. doi:10.1182/blood-2006-06-029934. PMC 1785094. PMID 16990598. ^ Thomas Anderson Henry (1949). The Plant Alkaloids (4th ed.). The Blakiston Company. ^ a b Carballeira, Luis; Pérez Juste, Ignacio (1998). "Influence of calculation level and effect of methylation on axial/equatorial equilibria in piperidines". Journal of Computational Chemistry. 19 (8): 961–976. doi:10.1002/(SICI)1096-987X(199806)19:8<961::AID-JCC14>3.0.CO;2-A. ^ Blackburne, Ian D.; Katritzky, Alan R.; Yoshito Takeuchi (1975). "Conformation of piperidine and of derivatives with additional ring hetero atoms". Acc. Chem. Res. 8 (9): 300–306. doi:10.1021/ar50093a003. ^ Anet, F. A. L.; Yavari, Issa (1977). "Nitrogen inversion in piperidine". J. Am. Chem. Soc. 99 (8): 2794–2796. doi:10.1021/ja00450a064. ^ Smith, Michael B.; March, Jerry (2001). March's Advanced Organic Chemistry: Reactions, Mechanisms, and Structure (5th ed.). Wiley-Interscience. ISBN 978-0-471-58589-3. ^ "List of Precursors and Chemicals Frequently Used in the Illicit Manufacture of Narcotic Drugs and Psychotropic Substances Under International Control" (PDF). International Narcotics Control Board. Archived from the original (PDF) on 2008-02-27. This page was last edited on 19 February 2019, at 06:32 (UTC).